Kristyn is 155cm tall (5'1"). For her first roadie, I designed pretty-much the smallest frame that I could based on standard 700C wheels. This entailed a whole lot of compromises; the head tube angle had to be made rather slack to reduce toe overlap, and the handlebar height, even with no spacers and a -17 degree stem, is only around 30mm below the saddle. Probably not such a problem for someone of my age, but Kristyn is an athletic 18 year old. I personally like to run 10-11cm of drop between saddle and handlebars, and I'm a hell of a lot older and less flexible than she is. 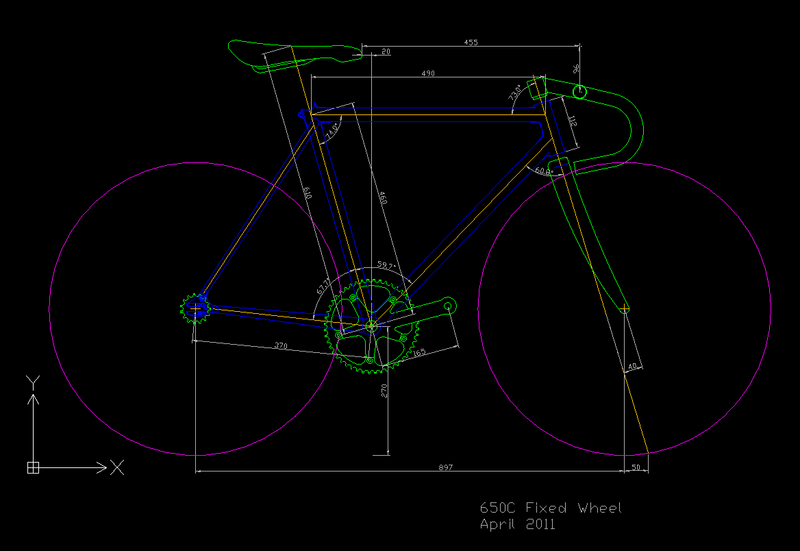 So for her second frame (a track bike) I'm thinking of using 650C wheels. By using smaller wheels, many of the problems encountered in shoehorning a smaller rider onto 700C wheels simply vanish. For a given toptube length, seat tube angle, and head tube angle, I get about 25mm of extra toe clearance. The minimum bar height is reduced by a clear 50mm, meaning she can get into a really aerodynamic, aggressive position. So I started doing the design. 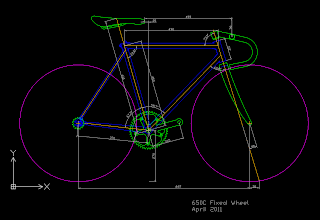 As I was drafting, it occurred to me that the design is very proportional, effectively a 53cm frame scaled down by a factor of 650/700, or 0.93 times. The only thing that breaks the proportionality is the bottom bracket height, which is set to 27cm to provide reasonable pedal clearance. The design I came up with is shown above. 74 degree seat tube and 73 degree head tube. 49cm level top tube and 46cm seat tube, with chainstays just 37cm long. If it were a geared bike, such short stays would doubtless play havoc with the chain line, but as it's fixed, all should be fine. A neat thing about scaling a medium sized 700C design is that most of the lug angles will work without significant manipulation, with the notable exception of the chainstay sockets, which are 68 degrees from the seat tube, so will need a little work. I imagine it will be plenty quick.